The recent Research Roundtable hosted by the ESE-TE committee of EECOM was a success! 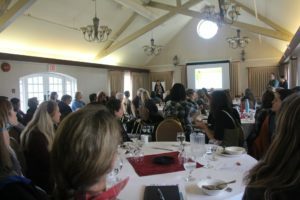 We welcomed over 70 educators and researchers to this event, which took place on Oct. 18 as part of the 2018 EECOM conference in BC. It was such a pleasure to meet so many people dedicated to learning about how to better integrate ESE into both preservice and inservice teacher education. The Roundtable hosted over 20 research presentations; a sincere thank you to all of the presenters! These provided an excellent introduction to the variety of research being done in ESE-TE across Canada, and initiated many conversations around the importance of teacher ed that permeated the wider EE conference. The day ended with three break out sessions focused on: Indigenous Ed and ESE; types of supports, resources, and professional learning needed in this area; and how best to move forward in this work. These drew on the experience and expertise of those in attendance to identify what is needed to broaden and deepen the work being done in ESE-TE.